Today’s episode is all the concept of Boundaries in Relationships in regard to a subsequent marriage that affects more people like biological and step children. What is a Boundary? A boundary is simply a property line to keep what is yours in and what is not yours out. Think of houses and the property lines that are drawn around each home. The history around Boundaries started several decades ago when research around how to help people with addictions took off. This research began to take a look at the family system and found enabling behaviors by other family members. This can also be called Co-Dependency. Out of this co-dependency movement specifically related to addictions, came the term Boundaries and began to be applied to all relationship issues not just addiction issue. A very helpful book about this topic is simply called Boundaries: How to Say No To Take Control of Your Life by Henry Cloud and John Townsend. They have also written one specific to marriages called Boundaries in Marriage. When healthy boundaries are not in place it can cause issues like depression, anxiety, resentment, and anger. By not implementing an appropriate boundary, you are replacing a temporary discomfort with a more permanent pain. 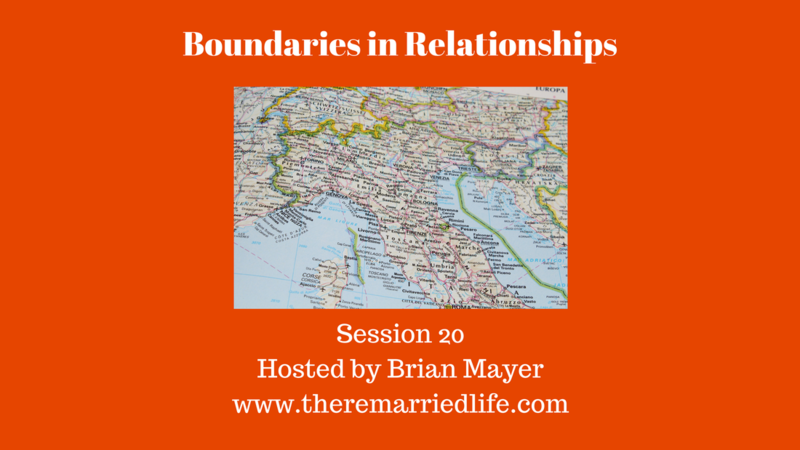 Boundaries sound easy in theory, but are hard to implement. When we first try to install a boundary on someone that is encroaching we can feel guilty or like we are a bad person. Sometimes we also have this mentality that we must be all things to all people and that is how the Golden Rule works – Do Unto Others as You Would have done to You. However, if you are not healthy first then you are no good to someone else. You will ultimately burn-out if you do not install good boundaries. I am selfish if I install a boundary. I am being disobedient if I say No. Learning to not feel responsible for others thoughts, feelings, and actions. For example, the kids being bored is not your responsibility. Now of course day after day, if you never do anything with them then yes that is a problem. But the fact is that they are responsible for how they feel. If we do not allow them to learn to pull themselves out a funk, then they will be stunted in their growth as adults. Can Love and Boundaries Exist Together: Yes they can. In fact, boundaries actually signal that love exists. Implementing Boundaries shows the other person under what parameters that love can flourish. Inside the boundaries amazing things will happen, outside the boundaries is where individuals can work on themselves. How Do Implement a Boundary Successfully? Get Support. Either find a group or ask a close friend. Role play setting boundaries by being both the boundary setter and the one for whom the boundary is being set. Do not beat yourself up when you try to set boundaries initially. You may fail and you probably will fail. Boundary setting is a process. You will receive much resistance at first because people will not be used to this. Expect failure and grow from it. The above resources are affiliate links, which means that The Remarried Life Podcast receives a percentage of the sale. Your cost does not change. By purchasing these items you are helping cover the cost of expenses to produce this podcast. Thanks in advance for your continued support of the podcast!